The time for flowers, chocolate and romance has arrived and we invite you and that special someone to spend an unforgettable day in Santa Clarita. Here, Valentine’s Day is whatever you want it to be. If you are searching for an excellent restaurant to wine and dine the night away, there are plenty of options to discover. If, however, you are looking for something a little bit different, like an exciting night out, Santa Clarita has just the event to make this a year to remember. For those looking for a fine dining experience, Newhall Refinery is always a great option. A farm-to-table gourmet restaurant that prides itself on a from-scratch menu, the restaurant is offering a special Valentine’s Day dinner that includes a four-course meal by candlelight, a beer or wine flight, live music and complimentary valet service. Make your reservations now as it’s sure to be a sell-out night to remember. Salt Creek Grille offers a “scratch cooking” dining experience where everything is fresh and prepared in-house. Line-caught seafood, center-cut steaks and fresh produce highlight an impressive menu put together by experienced chefs. Its Valentine’s Day special includes a four-course menu that includes baked brie, tomato and basil bisque, filet mignon and crab cake and red velvet cheesecake. For a romantic night out with your special someone, the Vines Restaurant & Bar, located in the Hyatt Regency Valencia, is the perfect nightlife destination. Order a craft beer or martini and toast one another while lounging by the restaurant’s patio fireplace. In addition to their delicious Valentine menu, The Vines has small plates, like seared scallops and calamari, to truly compliment the evening. If you can’t decide between dinner and adventure, Le Chene French Cuisine is offering the best of both worlds. In addition to a special Valentine’s Day menu, the restaurant also has a Valentine’s Day Murder Mystery Dinner Theater slated. The evening begins with a mingling reception at 7 p.m. in which diners meet “the suspects” and start gathering clues. As guests are dining on sumptuous entrees, they are also digging into a mystery. As an added incentive for keeping careful notes, prizes will be given to the guest with the best solution to the mystery. Reservations are required. The dinner special without the show is served between 5 p.m. and 9 p.m. Finally, what better way to celebrate romance and love than with the immortal words of The Bard, William Shakespeare? 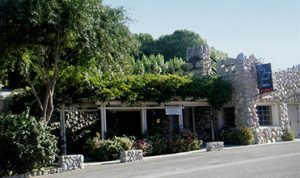 On Feb. 11, join members of the Santa Clarita Shakespeare Festival for “Shakespeare & Love,” an unforgettable night of food, wine, music and scenes about love from classic plays through the ages. This progressive dinner moves the audience from room to room for intimate theatrical scenes of love and is the perfect event for a unique night out. For more romantic ideas and inspiration to make every day feel special, visit our Couples Itinerary page.